The small room at the 92nd Street Y was almost full – with about 40 or so people of assorted ages with a surprising number of young, clearly admirers of his work. Mekas read from a folder of loose papers. His hands shook but his voice was clear and strong. One story was about the death of Allen Ginsburg; another powerful essay was about how he felt being a refugee. After his talk, Mekas and I went to a nearby restaurant with his son, Sebastian, and one of his associates, Jesse Pollock. Mekas is never without a camera. He is always filming. He showed me a tiny Nikon video camera, about the size of a credit card, that he carries in the top pocket of his jacket. I asked him about Lithuania. He said that his last visit to Lithuania depressed him. “Everyone treats me as if I am an old man!” he complained. Old in years but not in spirit for sure! 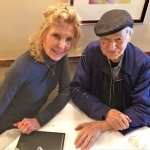 Mekas is one of the most energetic 95 year olds one could ever meet. In fact, he has been featured in The New York Times in a series on older New Yorkers which resulted in the book, “Happiness is a Choice You Make,” by John Leland. I thought it strange and sad that such a famous figure, who may very well be the only Lithuanian some Americans have ever heard of and who has done so much for the culture of this country while never forgetting his roots, would be overlooked by his fellow country men here. Mekas gave me a signed copy of his book and later sent me two DVDs of his 7 hour opus, “Lithuania and the Collapse of the USSR,” which he proudly said is shown in schools to remind the new generation that has grown up in freedom of those terrible dark days and the struggle to reestablish independence, finally achieved in 1991. 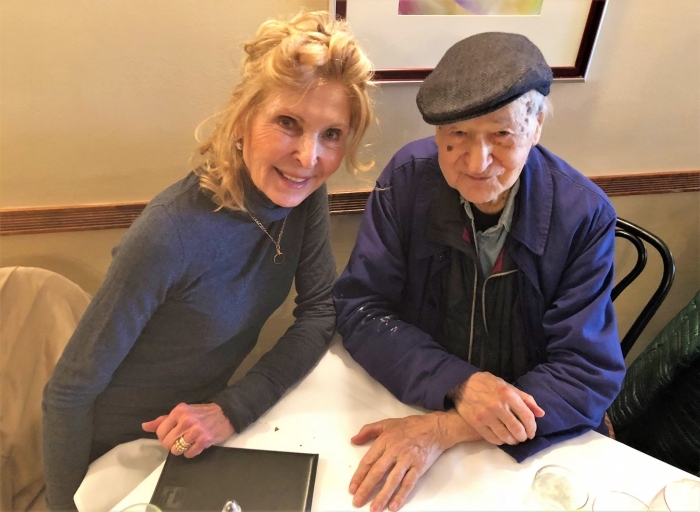 Leland’s book – a copy of which Mekas also gave me - looks at the science of longevity. Having a purpose in life, experts say, is one of the keys to a happy long life. Mekas would agree. He is now focused on trying to raise many millions to expand the facilities of the Anthology Film Archives, the library and theater he founded in 1970 which is still the leading place to see avant-garde films in New York. Leland writes that one of Mekas’ quotes really struck him - about the importance of living life wholly in the moment. Those words reminded me of another old, eternally young man, 96 years old when he left us in 2014. My father, Joseph Kazickas who lived life with joyful wonder, passion and gratitude. Every day is a gift, he always said. Life really is amazing. And so is Jonas Mekas!"